SalivaBio, LLC, developers of innovative, easy to use saliva collection devices, and Johns Hopkins University announced today that they have received final approval from the United States Patent Office for their Saliva Collection Aid (SCA). The Saliva Collection Aid simplifies the collection of passive drool saliva biospecimens for salivary bioscience research, thereby reducing participant burden and increasing compliance. The Saliva Collection Aid (SCA), exclusively available through Salimetrics, is a medical device used to facilitate the collection of whole saliva specimens directly into cryovials for storage or laboratory processing. Over the past 15 years, Salimetrics has validated saliva collection devices for salivary bioscience applications and only offers research proven, high-quality collection methods, designed for the unique properties of saliva. “Each year, we repeatedly witness the problems that poorly designed collection devices can cause, and we invest a lot of time into working with researchers to protect the quality of their data,” says Granger. The Saliva Collection Aid represents one step forward in improving passive drool (whole saliva) collection. From its contamination-free packaging, retention-free polypropylene design, to its easy, 4-step instructions and vented design that facilitates both ease of use and hygienic collection – everything about the Saliva Collection Aid was designed with salivary bioscience research in-mind. 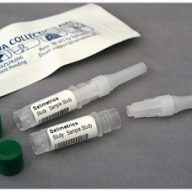 Include the added flexibility of being validated for all salivary analytes, universal fit for commonly used externally threaded cryovials, and the ability to collect multiple samples in the field (eliminating the need for further aliquoting or post-processing), the Saliva Collection Aid removes the guess-work from sample collection. “Since the SCA’s release, it has become a staple in the salivary bioscience community,” says Granger.